This post contains some affiliate links. This means that if you decide to click through and make a purchase, I might receive a small commission that helps me keep the blog going. Thank you for your support. Steve's Leaves have a new salad out that's a mixture of salad leaves, rocket and chives... and Persian Cress. The strawberries are in there because their sweetness pairs so well with peppery flavours - and I've added the bacon for saltiness and crunch. The chicken adds protein and balances those flavours out - and I've drizzled it with a little Extra Virgin Olive Oil. Easy peasy. Grab a couple of big handfuls of the Persian Cress salad and arrange on a plate. Grill or dry-fry 2 rashers of smoked, streaky bacon and chop into bite-sized pieces. Bash a chicken breast, covered with cling film, with a rolling pin until it's a uniform thickness. Heat a griddle and cook the chicken in a little coconut oil until cooked through. Allow to rest before slicing into strips. Next, wash 3-4 large strawberries and cut the green tops off. Cut them into wedges. 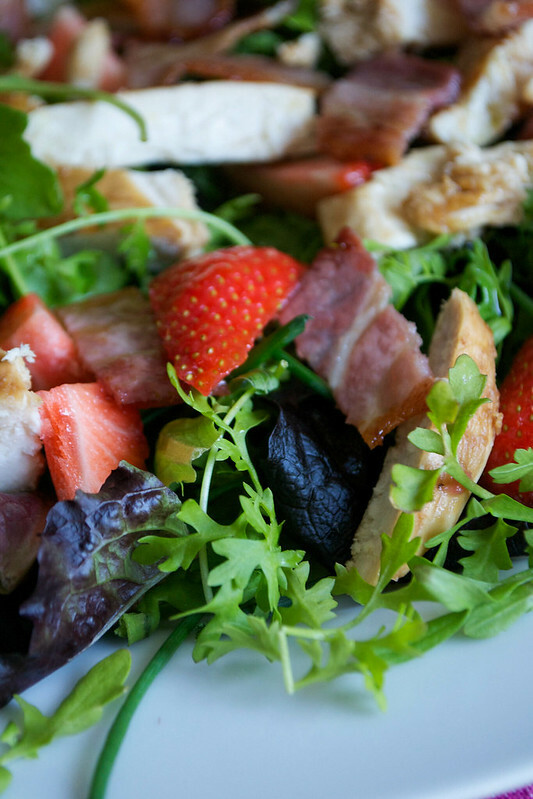 To assemble the salad, arrange the chicken and bacon over the top of the leaves and tuck in the strawberries. Drizzle with olive oil and give it a pinch of salt. Some chopped avocado would be good here, too. Note: If you can't get hold of Persian Watercress, use regular watercress instead, with a mixture of other leaves - snipped chives, rocket and raw spinach all all good. This recipe is featured in my ebook AIP and Paleo Snacks and Quick Lunches, available on Amazon Kindle. Packed with quick snacks and lunches that are all AIP-compliant, it will help you if you find time is tight to prepare good, healing food.